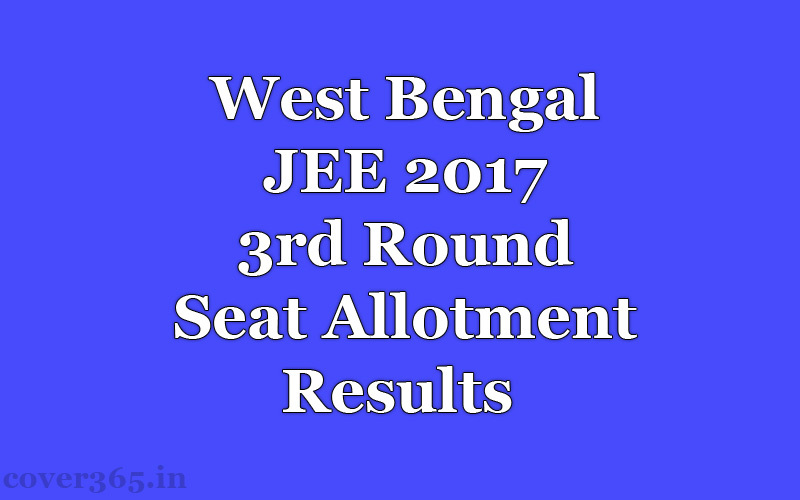 The West Bengal Joint Entrance Exam (WBJEE) 2017 3rd round seat allotment results have declared on its official website, http://wbjeeb.nic.in (West Bengal Joint Entrance Exam Board). Candidates those who all appeared in this exam can check their results at the official website. The Board had conducted the JEE (Joint Entrance Exam) 2017 for the admission in the Undergraduate Engineering courses on April 23. By using this results, candidates can get their favourite courses in various institutions of West Bengal. Now, the board declared the third allotment result while the first and second round seat allotment was already declared. It will redirect to another page which had the title of View Seat Allotment Result Round 3. View Institute Wise Seat Allotment: By using this option, a student can select the institute for which they want to see the seat allotment and check with their GMR/PMR number. View Opening & Closing Rank: Students can view the opening and closing ranks of all 3 rounds of allotment here by selecting the Round number, Exam Type, Institute Name and Branch Name. View Seat Allotment Result and Pay Seat Acceptance Fee: In this option, students need to login their account using Registration details like Roll Number and Password. NOTE: Due to traffic, students may get this notice “Our servers are facing a temporary technical problem.We regret the inconvenience caused. Please try again after some time.” So, try later sometimes. It is important that to carry all of your documents which related to WBJEEB 2017 3rd Round Seat Allotment at the allotted college from 13 July to 14 July 2017. You also need to the make the initial fee payment to confirm your seat. The West Bengal Joint Entrance Examinations Board was formed in the year 1962 for the purpose of holding Common Entrance Examinations for admission to the Undergraduate Level Engineering Courses in the State of West Bengal.